I just completed my long term Rough Rider runner project and this is how it came out. The last step was to finish a lexan shell from Kamtec, which was more challenging than I thought. 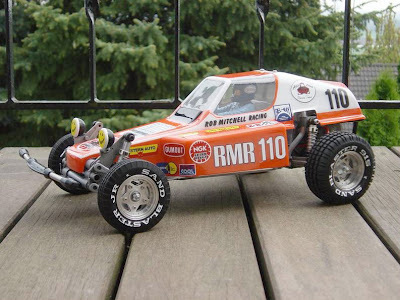 It's about 10mm too shorter than a genuine Tamiya body and did not work at direct fit. It could only be made by scratchbuilding a body mount clamp, which sets the body about 7 - 8mm forward. It looks a bit odd now where the rear shocks reach into the body, but it's ok for now. I used TamiyaClub repro decals and an unknown (at least for me) driver figure, which is attached to the body. This way I can swap the original body with this one when going for a ride. I'm still thinking about replacing the black bumper by something less expensive, but did not come to a good solution yet. Also the shocks might be changed again, as the CRP conversion does not work very well.